Your system is only as good as your... mousepad? Living by the adage "better hardware equals better gameplay," gamers are abandoning their limp, spongy pads for precision mousing surfaces. Arguably the best mousepad ever, fUnc's sUrface1030 will satisfy any gamer seeking that extra edge. This fUnc mousing surface is unquestionably the best in the industry. The pad's patent pending design includes two uniquely featured mousing designs. The one side of the pad has a smooth surface and the other a rough, to fulfill any mousing requirements. This pad will give even the most uncoordinated of computer users amazing precision and accuracy at whatever they are doing, whether it be gaming, graphical design, or just surfing the internet. 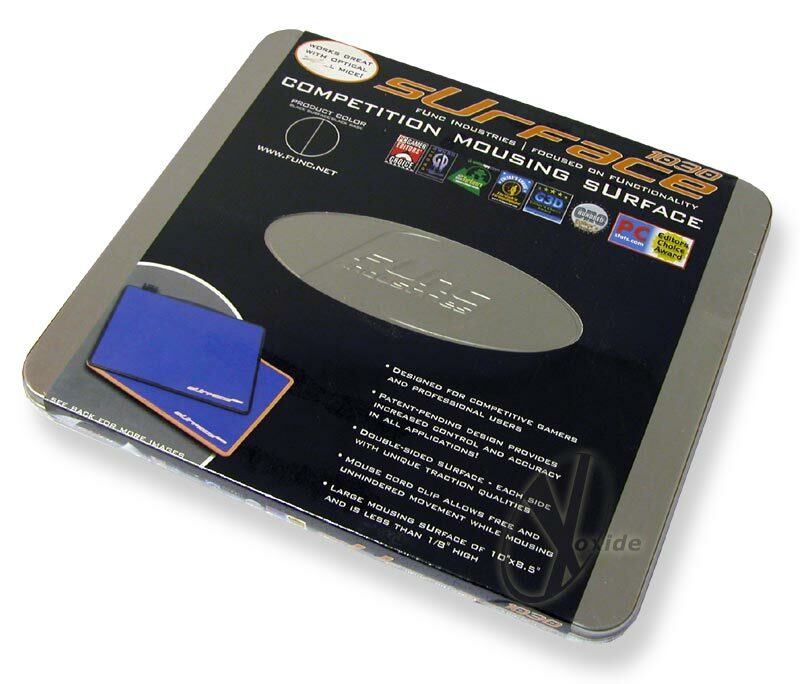 From the supercool metal traveling case to the precision-improving, double-sided mousing surface, the sUrface1030 stakes its claim as the king of all mousepads. Below, from left to right is; the fUnc mouse pad, the rough surface of the fUnc mouse pad, the smooth surface of the fUnc mouse pad, and the wire clip used for the pad.